Here’s a tense combination that challenges Sun in Virgo’s focus on precision with Moon in Sagittarius’ need to experience the big picture. Virgo analyzes, and Sagittarius explores. 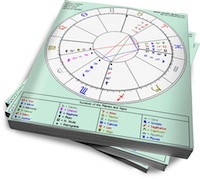 However, both of these Mutable signs are adaptable, so they may be able to combine their different approaches to knowledge and create a stimulating relationship. Sun in Virgo’s goal is to figure it out. Whether it’s his job, relationship or exercise routine, he must know exactly how everything works. He achieves this knowledge by drilling down to the smallest detail, and applying it to his life. In the context of romance, this makes him a dutiful if somewhat highly-strung partner. It’s easy for Sun in Virgo to get lost in the inconsequential specifics of his partnership, and lose sight of the bigger picture. This can create obsessive worries and a creeping knowledge that “something” is going to go wrong. Moon in Sagittarius needs to keep her eye on the horizon. Optimistic and adventurous, she’s always ready for more. She can be an upbeat but restless partner, and the best way for her lover to encourage commitment is to keep things fresh in the relationship. Moon in Sagittarius does not do well if she’s forced to settle into a domestic routine. An open-minded, flexible partner who constantly evolves is her best match. Sun in Virgo may require some time to figure out how he can meet Sagittarius’ needs. Moon in Sagittarius will initially feel stifled and annoyed by Virgo’s fussiness. But if they spend enough time together, Sag will eventually come to appreciate Virgo’s continuous quest for improvement, and Virgo will benefit from Sag’s buoyant, background support. Sun in Virgo will supply the relationship with a constant flow of information, and Sagittarius will fold it into the fabric of their domestic life, keeping it vibrant and ever-changing.